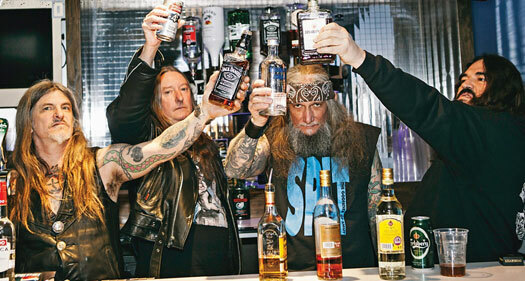 Home » News » SAINT VITUS: Reissue Two Classic Albums; Announce Australian Tour! Heavy/Doom metal progenitors SAINT VITUS have announced the re-release of their two classic albums ‘COD’ (1992) and ‘Die Healing’ (1995). The new, expanded editions of these critically acclaimed full-lengths will be released in August 2013 via Season of Mist. The re-issues of ‘COD‘ and ‘Die Healing’ will be available on CD and limited-edition LPs. Remastered and enhanced with two previously unreleased bonus tracks, ‘C.O.D.’ features COUNT RAVEN’s Christian Linderson on vocals, while ‘Die Healing’ sees original SAINT VITUS singer Scott Reagers return to the mic. All formats can be pre-ordered on Season of Mist’s e-shop. Both reissues are already available digitally on iTunes and all legal download or streaming platforms. In addition, SAINT VITUS have announced a July 4-date Australian tour starting on Thursday July, 18 in Brisbane and finishing up in Perth on July 21st. Full dates and venues are below. SAINT VITUS previously released ‘Lillie: F-65‘. The album, their first in 17 years, reunites the unmistakable guitar playing of co-founder Dave Chandler with the deeply resonate vocals of hard rock legend Scott “Wino” Weinrich. ‘Lillie: F-65‘ is streaming at the official SAINT VITUS Bandcamp page as well as below.